In Pakistan, It's Not Just Soldiers With PTSD : Parallels Post-traumatic stress disorder is best known for afflicting front-line soldiers in combat. But years of violence in northwestern Pakistan have made PTSD widespread among civilians in a poor and remote region where there are few options for treatment. 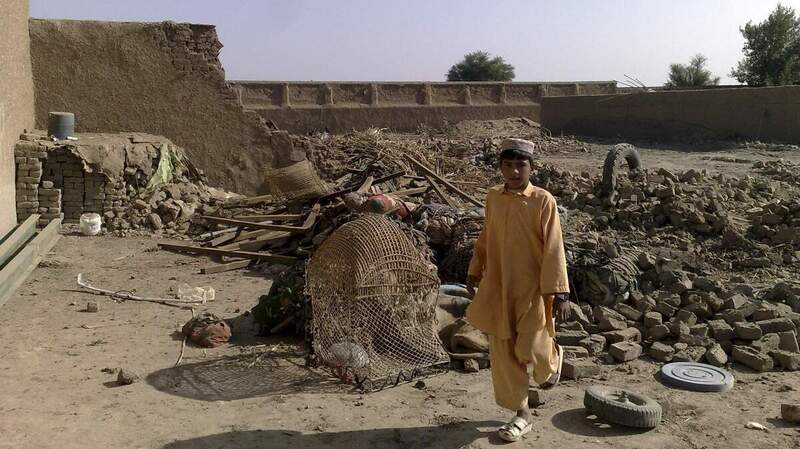 A boy stands at the site of a suspected U.S. drone attack in northwest Pakistan in 2008. Drone attacks and fighting in the region have resulted in post-traumatic stress disorder for many civilians, but few receive treatment. Noor Khan traveled more than three hours through treacherous mountain roads from his remote village of Bajaur to the city of Peshawar in northwestern Pakistan. He makes the journey every few months in an effort to quiet the whirring he hears in his head. The 27-year-old farmer has family and neighbors among the estimated 49,000 Pakistanis killed in conflict since 2001, when the U.S.-led war in Afghanistan first began to seep across the porous border. Khan's Bajaur village, a stronghold for both al-Qaida and Taliban militants, first came under U.S. drone strikes in 2004. Four years later, the Pakistani government launched an offensive to root militants out of the region. Khan says the first time he heard a drone strike, he was in his house. "The walls are made of mud, but they're very strong. You can't hear anything through them," he says. "But when the drone came, I felt like all of my doors were blown in even though it struck about a kilometer away from my house." Khan says that after this strike, the hum of the unmanned planes began to claw to the forefront of his mind. "It sounds like a broken fan. It clacks constantly," he says. Then, after some thought, he adds, "When you fall into the kind of depression I have, you hear these sorts of sounds all of the time." Post-traumatic stress disorder is best known for afflicting soldiers, especially those on the front lines of conflicts like Iraq and Afghanistan. But the disorder isn't limited to combatants alone. Years of violence in northwestern Pakistan have made PTSD widespread in a poor and remote region where there are few options for treatment. "A population that deals with frequent suicide bombings, the sight of violence, and daily insecurity, will be affected psychologically," says Dr. Anthony Feinstein, a University of Toronto professor who studies PTSD. "But to what extent drone strikes have added to the issue is hard to say." Feinstein, speaking by phone from Toronto, says there might be something especially distressing about drones. He refers to a study that found those controlling drones have a high level of "operational stress" and an increased chance of developing PTSD. "We can only imagine the effect on the people they target," he says. Dr. Khalid Mufti (left) speaks with Noor Khan, who is being treated for PTSD. Khan is a farmer in rural, northwestern Pakistan, where heavy fighting in recent years has caused many anxiety-related disorders among civilians. Khan, a squat man with a thick, bushy black beard, says he wasn't always willing to admit to his psychological disorder. Like many in his conservative community, he first sought aid from spiritual leaders who wrote out verses of the Quran, sewing them into squares of cloth to ward off evil forces thought by some to cause the distress. But when these scriptural talismans didn't calm his nerves, Khan sought medical treatment — though it wasn't easy to find. Sales of sleeping pills or anti-anxiety medications have surged in the region as people like Khan attempt to cope. Although they've waned in recent months, drone strikes have for years been instrumental in targeting the leadership of the Pakistani Taliban, including top commander Hakimullah Mehsud, who was killed last Friday in such an attack. The U.S. drone program is hugely unpopular among Pakistanis in general. However, studies have found that many in the Federally Administered Tribal Areas, a region along the border with Afghanistan, actually support the drone strikes, even if they aren't willing to say so publicly. Counseling for those who witness these aerial attacks can be hard to find. Pakistan has only one psychiatrist for every 100,000 people. Mental health facilities are especially scarce in the tribal regions. This has forced many to venture into Peshawar, the nearest urban center, for treatment. When they do, they often end up at Ibadat Hospital, which Khan first heard about from others in his village who struggled to deal with their own conflict-related anxiety. The hospital is a spare three-story building in a congested corner of the oldest part of the city. 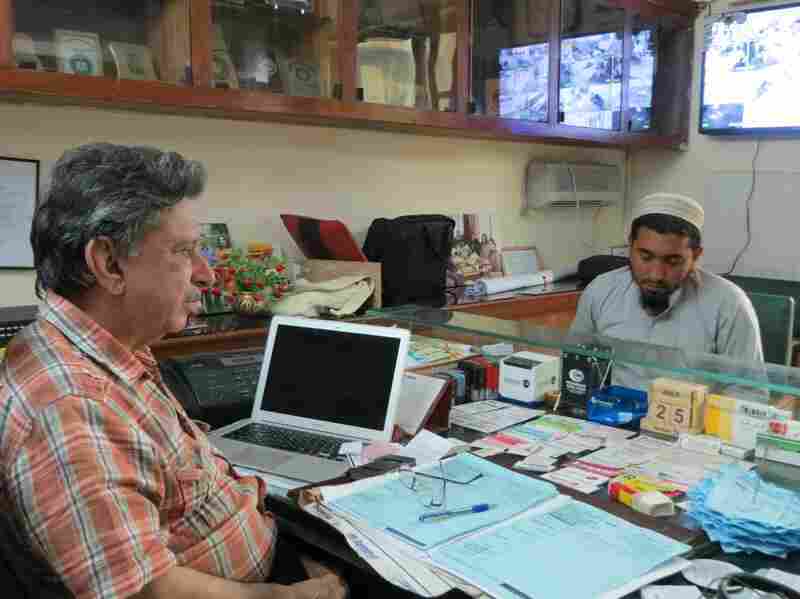 In his cluttered office lined with medical volumes, Dr. Khalid Mufti, the hospital's founder, greets Khan by name and asks after some of his neighbors. "I cannot count for you the number of people I've seen with real PTSD." Mufti explains, "Trauma affects people, for a certain period of time, but then people get [over] it." PTSD, however, is a seemingly never-ending aftershock to trauma in the form of anxiety, depression, paranoia, or all of the above. And, he says, its affecting more and more people in the region. Mufti estimates that 40 percent of people in the Federally Administered Tribal Areas have suffered from PTSD at some point. Aside from a largely anecdotal report released last year, the psychological impact of the ongoing conflict in Pakistan's perilous tribal regions has not been well-documented. Noor Khan, meanwhile, says there are multiple causes for the mental strife and the destruction in his remote village. When asked who he blames, the soft-spoken farmer says resolutely: "I think both of the parties played an equal part. The Pakistani armed forces are responsible for 50 percent of the casualties, and the Taliban are responsible for the other 50 percent." And, he adds, it's the sound of drones that keeps him up at night.